The Cooking Blog of Emilie French Chef: Homemade Confiture : happy Gift for happy Birthday !! Homemade Confiture : happy Gift for happy Birthday !! !! HAPPY BIRTHDAY HONEY !! Ooooh la la my hubby D. is turning 35 today. Although I didn't put 35 candles on the cake I organized for him a BIG SURPRISE PARTY with friends : French, American, Russian .... everybody was here! I offered my friends a little souvenir ... I thought that ot of Homemade Confiture (Jam) would be a yummy idea !! 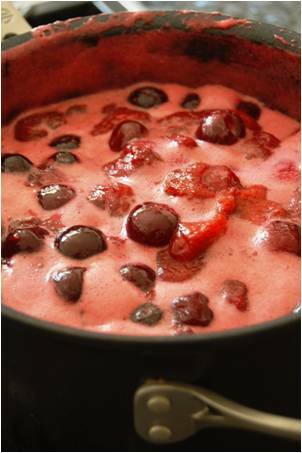 I decided to prepare a Confiture de Fruits Rouges (Red Berries Confiture) with Cherries, Blueberries, Strawberries and Raspberries. After washing the fruits carefully, the fruits were ready to melt slowly with the sugar. And now, you only have to wait. It is easy, no ?? 1 hour later .... hmmm, it smells fruits fruits in all my kitchen ... the Confiture is now ready to go in the pots !! - Wash all the fruits. Coarsely chop the strawberries and pit the cherries. - Add Strawberries, Raspberries and Cherries in a large pot. Turn to cook on medium heat with sugar and lemon juice until the strawberries pieces are melted, around 35mn. Then add Blueberries. (I like to put the fruits and the sugar in a big bowl and let everything macerate overnight (or 8h). - Prepare the jars : I recommend to boil the jam jars and lids and then let them dry up-side down before putting in pot. 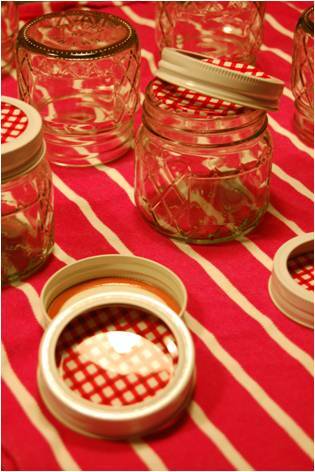 - Put all the jars in boiling water a few minutes to sterilize them. Dry meticulously. - Pour the jars with the Confiture, close immediately with the lids and put them in reverse. Wait until the jam is cool and keep the jars in a cold and dark place (you can also keep it in the refrigerator). - Allow 2 weeks to 2 months before enjoying !! It sounds so yummy !! I can't wait to try it for my next Breakfast ! Yum, yum...I cannot wait to try it!! Breakfast will never be the same!!!!! Merci beaucoup pour la recette tres agreable - quatre fruits. Je vais essayer de le faire bientot. Les pots sont aussi mignons. Mais, j'ai un question parce que je suis une debutante en culinaire: est-ce qu'on doit laisser cette confiture ou n'importe lesquelles pendant quelques semaines?